Japan and South Korea have both flown planes unannounced through China's newly-declared air defence zone, officials from both nations say. Japanese aircraft had conducted routine "surveillance activity" over the East China Sea zone, the top government spokesman said. South Korea had also conducted a flight, its defence ministry said. China says planes transiting the zone, which covers areas claimed by Tokyo, Seoul and Taipei, must file plans. 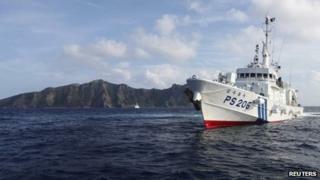 The zone includes islands known as Senkaku in Japan and Diaoyu in China which are claimed by Japan, China and Taiwan. Japan controls the islands, which have been the focus of a bitter and long-running dispute between Japan and China. The zone also covers a submerged rock that South Korea says forms part of its territory. China, which established the air defence identification zone (ADIZ) on Saturday, says aircraft must report a flight plan, communicate and identify themselves. Those who do not could face "defensive emergency measures". China's move has been condemned by the US and Japan. America, which called the move a "destabilising attempt to alter the status quo in the region", flew two unarmed B-52 bombers through the zone unannounced on Tuesday. Japanese officials did not specify when the flights happened, but confirmed the surveillance activity. "Even since China has created this airspace defence zone, we have continued our surveillance activities as before in the East China Sea, including in the zone," said Japan's top government spokesman, Yoshihide Suga. "We are not going to change this [activity] out of consideration to China," he added. For their part, South Korea's military said one of their planes entered the zone on Tuesday. South Korea's Foreign Minister Yun Byung-se said on Wednesday that the air zone issue had made "already tricky regional situations even more difficult to deal with". "We've witnessed competition and conflicts among players of the region getting fiercer," he told Yonhap news agency. On Thursday South Korea and China held talks on the zone, but failed to reach any agreement. China defended its establishment of an air zone on Thursday, with a Defence Ministry spokesman telling state media it was "completely justified and legitimate". US Vice-President Joe Biden is expected to express America's concerns to China when he makes a scheduled visit next week. Mr Biden would "convey our concerns directly and... seek clarity regarding the Chinese intentions in making this move at this time", a senior US official administration said. Mr Biden will also make stops in Japan and South Korea during his trip to Asia. Meanwhile, Philippine Foreign Secretary Albert del Rosario said China's air zone move in the East China Sea may have implications for territorial disputes in the South China Sea. His comments come as China's aircraft carrier, the Liaoning, and its warship escorts headed to the South China Sea for what has been described as a training mission. "There's this threat that China will control the air space [in the South China Sea]," Mr Del Rosario told local media. "It transforms an entire air zone into China's domestic air space. And that is an infringement, and compromises the safety of civil aviation," he said, adding it "also compromises the national security of affected states". Aside from the Philippines, Vietnam, Malaysia, Brunei and Taiwan also have overlapping claims with China in the South China Sea.